Laramie, Wyo. 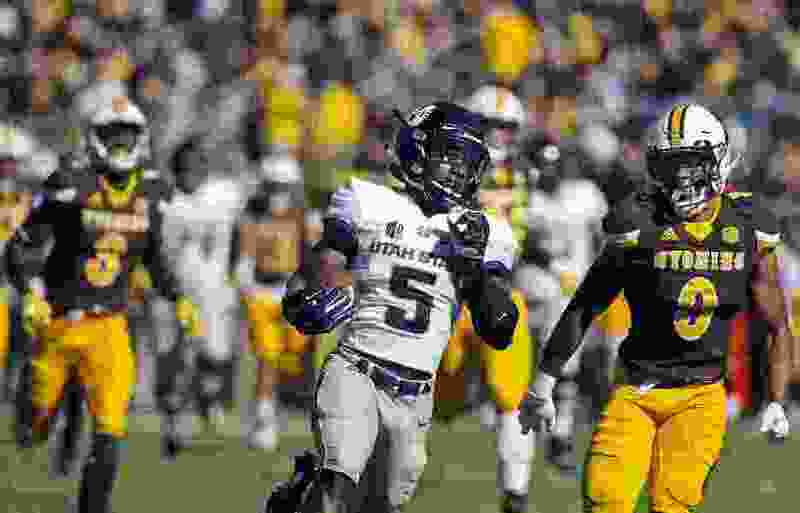 • Its high-scoring offense largely kept at bay, Utah State turned to defense and special teams to earn its sixth straight victory, 24-16 over Wyoming on Saturday. In his first appearance, Wyoming freshman quarterback Sean Chambers, No. 3 on the depth chart, came off the bench to spark a long-dormant offense with 100 yards rushing and 62 passing. He led the Cowboys (2-6, 0-4) to three scores in four drives to cut the lead to 24-16 with 5:32 remaining. Wyoming got the ball back at its own 25 with 2:12 to play but Tyler Vander Waal came back in and misfired on four straight passes, and Utah State ran out the clock to hand the Cowboys their fourth straight loss. “We’re trying to get on a championship run, to put ourselves in position in November,” Utah State coach Matt Wells said. Rocquemore said the Aggies prepared for the bootleg, which the Cowboys ran to start the third quarter. The linebacker anticipated the play, picked off Vander Waal’s pass and returned it to the Wyoming 3-yard line. NIco Evans led all carriers with 133 yards on 25 attempts, including a 53-yard TD run for the Cowboys. He credited Chambers with a lot of poise. Wyoming coach Craig Bohl credited Chambers with bouncing back after a lost fumble on his second play. “That’s not an ugly game; that’s a beautiful game,” Wells said. He admitted he didn’t realize Utah State became bowl eligible for the seventh time in eight seasons until someone called his attention to it. Wyoming: The offense (128th in scoring, 127th in yardage) continued to struggle until coach Craig Bohl gave play-calling duties to Chambers. The freshman fumbled on his first series in the first quarter and returned to bench. But after Vander Waal threw an interception on the first play of the second half, Chambers led the offense until the final series. He guided the Wyoming offense to 257 of its 331 yards. Evans (133 yards) and Chambers (100) became the first pair of Cowboys to each gain 100 yards rushing since Brett Smith (138) and Shaun Wick (116) accomplished the feat against New Mexico on Oct. 12, 2013.